Sprocket, Rear 30T, #420, Aluminium, (Red)Upgrade your bike with TYGA Sprockets. Sprocket, Rear 32T, #420, Aluminium, (Blue)Upgrade your bike with TYGA Sprockets. Sprocket, Rear 32T, #420, Aluminium, (Gold)Upgrade your bike with TYGA Sprockets. Sprocket, Rear 32T, #420, Aluminium, (Red)Upgrade your bike with TYGA Sprockets. Sprocket, Rear 33T, #420, Aluminium, (Blue)Upgrade your bike with TYGA Sprockets. Sprocket, Rear 33T, #420, Aluminium, (Gold)Upgrade your bike with TYGA Sprockets. Sprocket, Rear 34T, #420, Aluminium, (Gold)Upgrade your bike with TYGA Sprockets. Sprocket, Rear 35T, #420, Aluminium, (Gold)Upgrade your bike with TYGA Sprockets. Sprocket, Rear 35T, #520, Aluminium, (Gold)Upgrade your bike with TYGA Sprockets. Sprocket, Rear 36T, #520, Stock, Aluminium, (Gold)Upgrade your bike with TYGA Sprockets. Sprocket, Rear 36T, #420, Aluminium, (Gold)Upgrade your bike with TYGA Sprockets. Sprocket, Rear 36T, #520, Aluminium, (Gold)Upgrade your bike with TYGA Sprockets. Sprocket, Rear 37T, #520, Aluminium, (Gold)Upgrade your bike with TYGA Sprockets. Sprocket, Rear 37T, #520, #520, Aluminium, (Gold)Upgrade your bike with TYGA Sprockets. Sprocket, Rear 37T, #428, Aluminium, (Gold)Upgrade your bike with TYGA Sprockets. Sprocket, Rear 37T, #420, Aluminium, (Gold)Upgrade your bike with TYGA Sprockets. Sprocket, Rear 38T, #520, Aluminium, (Gold)Upgrade your bike with TYGA Sprockets. Sprocket, Rear 38T, #525, Aluminium, (Gold)Upgrade your bike with TYGA Sprockets. Sprocket, Rear 38T, #520, Stock, Aluminium, (Gold)Upgrade your bike with TYGA Sprockets. Sprocket, Rear 38T, #428, Aluminium, (Gold)Upgrade your bike with TYGA Sprockets. Sprocket, Rear 38T, Aluminium, (Gold), See model applicationUpgrade your bike with TYGA Sprockets. Sprocket, Rear 39T, #520, Aluminium, (Gold)Upgrade your bike with TYGA Sprockets. Sprocket, Rear 39T, #525, Aluminium, (Gold)Upgrade your bike with TYGA Sprockets. Sprocket, Rear 39T, #428, Aluminium, (Gold)Upgrade your bike with TYGA Sprockets. Sprocket, Rear 39T, Aluminium, (Gold), See model applicationUpgrade your bike with TYGA Sprockets. Sprocket, Rear 40T, #520, Aluminium, (Gold)Upgrade your bike with TYGA Sprockets. Sprocket, Rear 40T, #525, Aluminium, (Gold)Upgrade your bike with TYGA Sprockets. Sprocket, Rear 40T, #428, Aluminium, (Gold)Upgrade your bike with TYGA Sprockets. Sprocket, Rear 40T, #530, Aluminium, (Gold)Upgrade your bike with TYGA Sprockets. 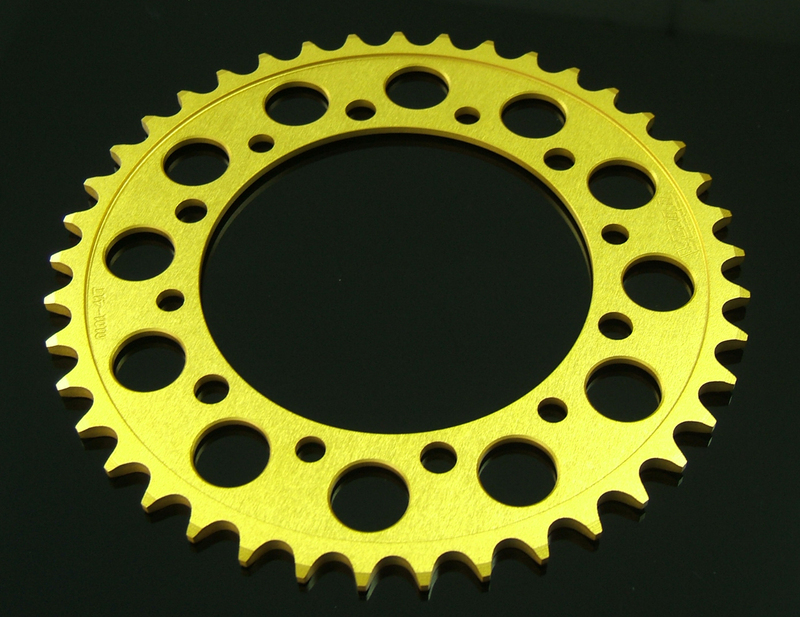 Sprocket, Rear 40T, Aluminium, (Gold), See model applicationUpgrade your bike with TYGA Sprockets. Sprocket, Rear 41T, #520, Aluminium, (Gold)Upgrade your bike with TYGA Sprockets. Sprocket, Rear 41T, #525, Aluminium, (Gold)Upgrade your bike with TYGA Sprockets. Sprocket, Rear 41T, #428, Aluminium, (Gold)Upgrade your bike with TYGA Sprockets. Sprocket, Rear 41T, #530, Aluminium, (Gold)Upgrade your bike with TYGA Sprockets. Sprocket, Rear 41T, Aluminium, (Gold), See model applicationUpgrade your bike with TYGA Sprockets. Sprocket, Rear 42T, #520, Aluminium, (Gold)Upgrade your bike with TYGA Sprockets. Sprocket, Rear 42T, #525, Aluminium, (Gold)Upgrade your bike with TYGA Sprockets. Sprocket, Rear 42T, #428, Aluminium, (Gold)Upgrade your bike with TYGA Sprockets. Sprocket, Rear 42T, #530, Aluminium, (Gold)Upgrade your bike with TYGA Sprockets.